Carmen gave me one rule about preaching: Never mention her in a sermon. Since I’ve already violated that rule, I might as well continue. “For the wedding,” she said. “What? You’re ready to set the date? We just got engaged!” said I. After nine years of dating, all of a sudden, this whole thing was moving very fast. There are two aspects of this story I’d like to focus on. 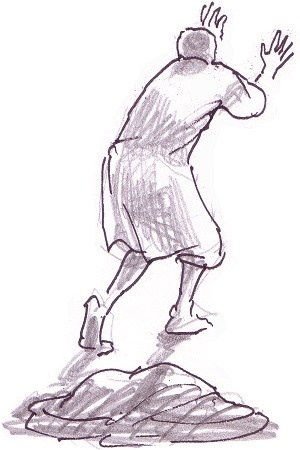 First, there is the curious detail that Bartimaeus sheds his cloak as he rises to go to Jesus. Why did he discard one of the few things he had, and something as valuable as a cloak? Some scholars see this as Bartimaeus rejecting worldly possessions on his way to Christ. The second is about Bartimaeus regaining his sight. That’s a pretty essential part of the miracle—Bartimaeus is blind, so healing the blindness is the obvious outcome of the story. But there is a potential to fall into a trap here. If we read it linearly, then the story seems to suggest that, if Bartimaeus shows his faith, then his greatest need will be met. We could take this to mean that there is a deal on the table: if we are faithful, then miracles will happen. One is the consequence of the other. Over the course of human civilization, we have developed a keen sense of fairness and, when it’s violated, a system of justice to restore that fairness. We demand fairness in our social structures, and get angry (and hopefully vote) when that fairness is abused. In asking why God allows bad things to happen, we are demanding that same fairness from God. Bartimaeus didn’t ask to be blind. Contrary to conventional belief at the time, he likely didn’t do anything to upset God to bring this affliction upon himself. His blindness wasn’t fair. But it was his burden, as it is our burden to carry those things that, big or small, we did not deserve. So Bartimaeus sheds his cloak. We hold tightly to those things, real or abstract, that we feel will protect us against the unfairness of the world. But Bartimaeus sheds his cloak. It is in this act that Bartimaeus demonstrates his total commitment to faith. He has not asked for anything; there have been no bargains or agreed-upon outcomes. He has not traded his cloak for something better. We have to shed our own metaphorical cloaks—those things we hold on to too tightly because to give them up is to concede something that we’ve fought hard to own. The question to you is this: What do you wrap yourself in that prevents you from total commitment to faith? It is curious that we use the phrase “blind faith” to describe total commitment to faith, but what Bartimaeus teaches us is absolutely the opposite. Through his commitment to faith, the once-blind Bartimaeus can now see. The message is unambiguous: Faith will open your eyes. Open your eyes to what? If we fall into the trap that this is somehow a deal, then we will also believe that there must be a fair set of rules that govern our relationship with God. If we pray the right way, if we go to church often enough, if we bow in front of the altar, if we cross ourselves at the right time, if we obey the rules, then God will grant our petitions, will restore us to health, will keep our kids away from danger, will treat us fairly. Is this really what is happening with Bartimaeus? Bartimaeus’ strong faith has restored his eyesight. But just as shedding the cloak is a metaphor for what holds us back, the restoration of his eyesight is a metaphor for understanding what his faith really means. Because of your faith, Bartimaeus, your eyes are open. Not: If you have faith, then you get your eyesight back. Do you hear the difference? It’s subtle, but absolutely essential. Faith opens our eyes not to how God works, but rather to understand that we simply cannot fully understand how God works. And this means we have to come to grips with the fact that there will never be fairness as we humans define it. There can be no bargaining with God. Jesus, the Son of God, came to earth to open our eyes to the wonder of God, not to explain God. No matter how much we try, we can never fully and completely understand God, not while we are incumbered by our humanness. And yet we absolutely have to try. We have to work every day to identify those things that hold us back from our faith and shed them like a cloak. That work starts here, and it starts with a single word: commitment. The seed of commitment begins inside you as you open yourself to faith in a God you cannot understand but desperately want to. You must nurture that faith with your own private disciplines of prayer and devotion and curiosity. But that is not enough. Faith requires a community for reinforcement and expansion. You know that. That’s why you’re all here. But you can’t just be here. You have to deepen your commitment to this community. It’s more than just showing up, but showing up is a good start. It takes participation and engagement. It takes being open and active to finding the places where you, exactly you, can make a difference. It takes making this community a central part of your lives, not just an adjunct association only when it is convenient. Bartimaeus did not sit waiting for Jesus to come to him. You have to cry out, get up, and act. The Bartimaeus miracle plays out in the span of seven verses in Mark. The miracle of our own faith journey plays out over a lifetime of being in community with each other, working with each other, loving and supporting each other. We strengthen our faith by strengthening the community, which of course strengthens our faith, and it is this faith that brings us closer to understanding God. You asked. Jesus answered. Now you have to make the commitment. Go; Faith has made you well.